Making a blog is the easiest job on the planet; you just need to have the idea to create it. Whether your blog is personal or informative, monetary or not there will be surely lot of things on a blog that people want to know and discuss about. Further if you have a hosted domain rather than self- hosted, it will give your blog a professional look. Maintaining a blog is cheaper, all that costs is your effort and a little of marketing and advertising. For example, you can give an eye catching introduction through written communication in social networking sites. Make sure that the content you choose is written in such a fashion that it make the readers glued to the post. You can also add many widgets to give your blog a more professional look. Chatwing is an exceptional chat software, it is somewhat similar to chat boxes but through it you can connect with larger audience. chatwing works on a simple process of connecting your visitors to chat networks of other visitors or blog owners. For instance if you own a blog on movie reviews you can join a network pertaining to related discussions. In addition to it, you can also create your own network. This software is completely free and comes with an installation easy enough to be understood by people who have even the primary knowledge of creating and maintaining blogs, so you do not have to rework your budget if you are planning to use it. All you have to do is sign up your domain with chatwing , you will receive an html code that you can easily embed to your blog or website. The perks using chatwing doesn’t end here as it will help you in making money because it works on CPC or cost per click basis. The widget also has an advertisement banner with a rotational function which helps each of your users to see all the ads. You can redeem your cash using paypal once you reach $25 cash limit. To make most of from the chatwing’s option you need to advertise your website. Commenting on other blogs of same genre as your blog can be really helpful. Comment on their entries or posts regularly and seem genuine while doing that because if you pretend everybody can figure it out. Although most blogs do not allow putting URL’s in the section you can put the URL in your handling name or you can even leave a message or use trackback technique for the other users to reach out you. 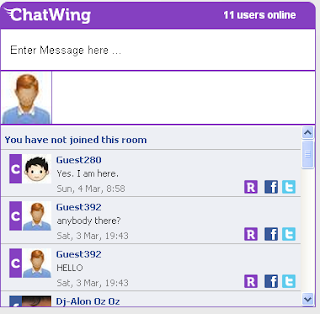 Online chat could have never been fun and profitable without Chatwing.